‘Only God Can Judge Me’. That was the song that got me hooked to 2Pac, instantly. Me, that was – at the time – a 14-year-old middle-class white boy from Belgium, Europe. I was only just discovering hip-hop culture and rap music after seeing Dangerous Minds and buying Coolio’s ‘Gangsta’s Paradise’. It was my older sister who brought home All Eyez On Me (1996), intended as a birthday gift for a friend. We decided to listen to it first. Shortly after, I read an article in a local magazine (dating some months back) talking about 2Pac being shot and killed. (Keep in mind, this is end 1996/beginning 1997 and information was scarce and the Internet was not yet so easily available and most definitely not so elaborate.) The music album and that article were the instigators for a never-ending interest in one of hip-hop’s most colourful personalities. Since, only two other (rap) albums would have a similar effect on me: Eminem’s Marshall Mathers LP (2000) and 50 Cent’s Get Rich or Die Tryin’. Neither artist, however, managed to keep my attention throughout their musical evolution, whereas Tupac – the music artist and the person – still manages to captivate me today, more than twenty years after hearing of him for the first time. 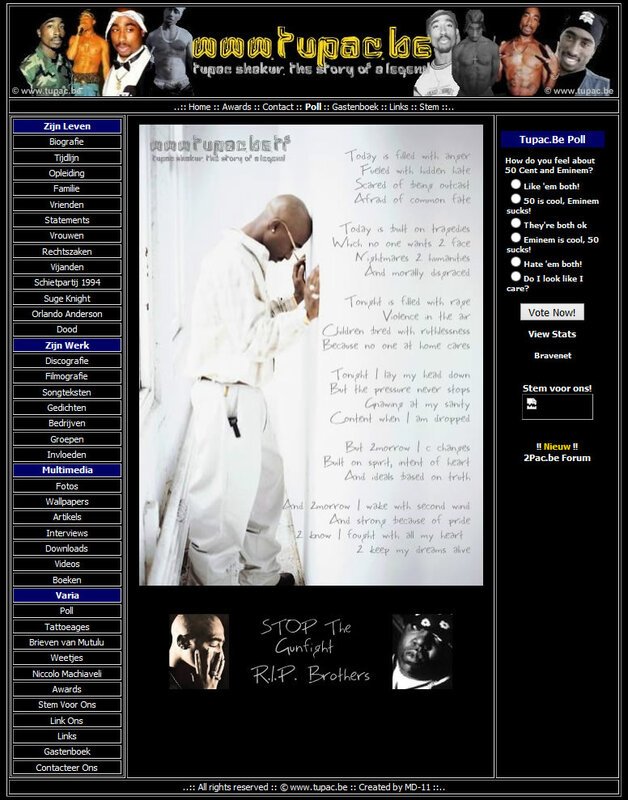 The first full version of this website was launched on March 5, 2001, as “www.tupac.be.tf”. At its peak, it was the largest and most popular Dutch-language 2Pac fansite and even one of the biggest English-language ones. Our record day was September 22, 2001, when we registered 799 unique visitors coming to this website. 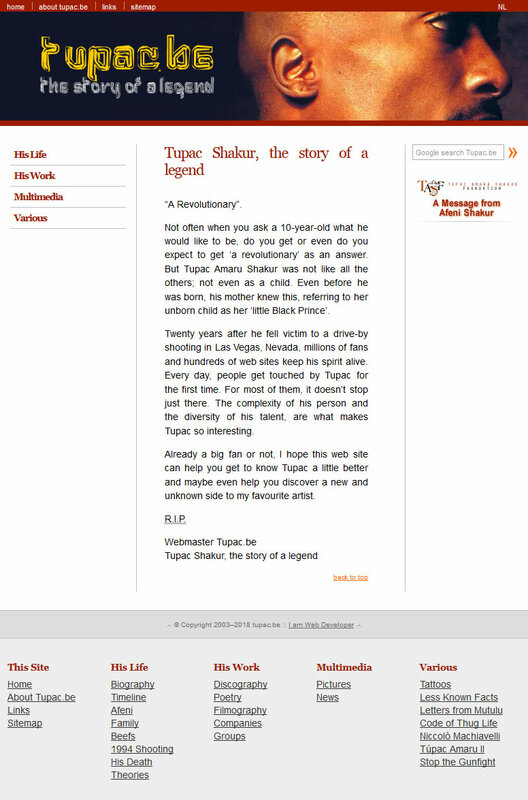 Since May 8, 2003, the website’s URL has been “www.tupac.be”. With the years since Tupac’s death passing by, with less and less time to maintain the website, and with the design getting out of date, the website started getting less visitors. By the time the design was replaced, the website still had a total of nearly 175000 visitors in over just over 7 years. The second version of the website was launched in two fases in 2008. It got a complete redesign, making it brighter and more colourful. The content was also completely revised and rewritten. The English part was launched on Monday 16 June 2008, to mark Tupac’s 37th birthday. The Dutch translation was launched three months later, on Saturday September 13, 2008 (the 12th anniversary of Tupac’s demise). By the time the moment had come to also give the second version a new facelift, it had generated a good 86500 visits in the 10 years it was live. Still, not bad for a barely evolving topic. About 51% of our audience comes from the Netherlands, 28% from Belgium and 8% from the United States. Obviously, the peak days are every year around June 16 and September 6-13, still attracting up to over 320 visitors. 10 years after the last redesign, 2018 seemed a good year to tackle the website again: a complete redesign, which is responsive and has gold, silver and white as the main colours. We also simplified the structure and got rid of some pages, but also added one. Which brings us to the content, which in the meantime was also outdated and thus rewritten again all over again, based on (new) facts collected over the last few months and years. The nice thing about doing this more than 20 years after Tupac died, is that more information is available about what really happened, with more people involved talking more freely. The current version went live on Monday October 1, 2018. If you are already a big fan or not, we hope you like this website and that it helps you to get to know Tupac a little better. Dyson, Michael Eric. Holler If You Hear Me. Basic Cavitas Books, 2001. Ex, Kris (Foreword). Tupac: a Thug Life. Plexus Publishing Limited, 2005. Guy, Jasmine. Afeni Shakur: Evolution of a Revolutionary. Atria Books, 2004. Kading, Greg. Murder Rap: The Untold Story of the Biggie Smalls & Tupac Shakur Murder Investigations. One-Time Publishing LLC, 2011. Shakur, Afeni. Tupac: Resurrection, 1971-1996. Simon & Schuster UK LTD, 2003. Shakur, Tupac. The Rose That Grew From Concrete. Quartet Books Limited, 2000. White, Armond. Rebel for the Hell of It: The Life of Tupac Shakur. Thunder’s Mouth Press, 1997. Chambers, Veronica. Conversations With Tupac. Esquire, 1996. Meadows-Ingram, Benjamin. My Brother. XXL, 2000. Philips, Chuck. Q&A with Tupac Shakur. Los Angeles Times, 1995. Philips, Chuck. Who Killed Tupac Shakur?. Los Angeles Times, 2002. Powell, Kevin. Bury Me Like a ‘G’. Kevin Powell, 1996. Ro, Ronin. Have a Gun Will Travel. Quartet Books, 1998. Rubin, Joshua. King of Stage. XXL, 2001. Senza, Danzy. Violence is Golden. Spin, 1994. Sway. Interview on the Westside Radio Show. KMEL, 1996. Broomfield, Nick. Biggie & Tupac. Moviehouwe Entertainment, 2002. Lazin, Lauren. Tupac: Resurrection. Paramount Pictures, 2003. Long, Sean. Tupac Shakur: Before I Wake. Xenon Pictures, 2001. Savidge, S. Leigh. Welcome to Death Row. Xenon Pictures, 2001. Spirer, Peter. Tupac Shakur: Thug Angel (The Life of an Outlaw). QD3 Entertainment, 2002. Tan, George. Tupac Shakur: Thug Immortal. Xenon Pictures, 1997. Thomas, Jay Lee. 2Pac 4 Ever. Concrete Treehouse, 2003.